Last week the web was wriggling with outrage over The Disney Store Corporation offering for sale a Mickey Mouse™ T-shirt in the graphic style of Joy Division's Unknown Pleasures albumcover -- not that the iconic white-on-black waveform image (plucked from the Cambidge Encyclopedia of Astronomy by drummer Stephen Morris) was any stranger to absurd marketing schemes. Besides being WFMU’s first callerless call-in show, Thunk Tank rarely features music. Every week we go through the new CDs that have come into the station, and find a few we like, and bring them into the studio, and then don’t play them. If we were playing music, though, right now we would be playing a lot of banda, a style of brass-heavy oompah music from the Mexican state of Sinaloa—also home of the pointy boots! But that's tribal music, not banda. Banda instrumentation includes accordions, tubas, sousaphones, slide trombones, clarinets, and a drum with no kick pedal and a manual hi-hat. Diligent viewing of Mun2 TV has convinced Bronwyn that banda songs are mostly about fat pizza delivery guys who get beautiful girls, and young busboys who get beautiful girls, and school janitors with beautiful janitress girlfriends who can’t stop looking at the high school girls. Scott Williams played two pieces of spacey music, one from big band leader Don Ellis, then one from The North Sea. Ellis specialized in complex time signatures, and was using electronics on his albums two years before Miles Davis made In A Silent Way. Fred Cash, who sang in the Impressions with Curtis Mayfield, will be Michael Shelly's guest this Saturday, from Noon-3pm. Last week, Michael began his show with a set composed in part of The Leopards, Amsterdam, and Delbert Barker. Marty McSorley played Terminator X, followed by new music from U.S..Girls. He also payed tribute to disco bandleader Jimmy Castor, who died last week. On Tuesday, January 31st from 6-9am, Black Pus will be Marty's guest. Monica played new music from 9th Ward Marching Band, who only perform during New Orleans carnival season. Jimmy Castor was featured, as was Etta James. James recorded many blues and R&B records, "At Last" perhaps the best well known. She died last week. In '79, the Handgrenades issued what would become the best UK DIY punk single not actually from the UK: their "Demo to London" b/w "Coma Dos" 45, self-released in an undetermined quantity on the band's unnamed imprint. The single is a killer. It was also once a source of profound mystery -- to collectors and wayward punk geeks, at least. Omitted on the sleeve are the band's roster, their location and where they recorded their material, and the only nuggets of information profferred are a production credit attributed to Bob Levitan and the word "phonographix." Given this anonymity, and in light of the title and subject of "Demo to London" -- not to mention the otherworldly cut-up cover art, production, vocals, and musicianship (or lack thereof) -- many took the band's provenance to be London, or perhaps the outskirts of Manchester. The flip's manic "Coma Dos" sheds even less light on the single's origin, and the listener's left with a clang-punk artifact of the highest random order, reminiscent of contemporaries like Swell Maps, the Petticoats, Desperate Bicycles, so on, so forth. The day after last week's inspiring protest against overreaching anti-piracy laws, the US Department of Justice demonstrated that they don't need those laws, anyway. They just went ahead and unilaterally shut down Megaupload, the world's most popular cyberlocker. Rumor has it that similar sites like MediaFire and 4shared are under investigation and have been deleting files, while FileSonic preemptively disabled all sharing features. As a result, much of the history of recorded sound has been made inaccessible to the public. I'm talking, of course, about the music blogosphere. The best music blogs aren't pirates. They are libraries, sound archivists and music preservationists sharing recordings that would not otherwise be available. And now sites like Global Groove, Mutant Sounds, and Holy Warbles have lost large swaths of the material they'd salvaged from obscurity. All was copacetic during SOPA/PIPA smackdown day last Wednesday, the day of last week's Motherlode posting. Then came Thursday and bloodbath in blogland as the popular file-sharing site MegaUpload was seized and shuttered for copyright violation by the U.S. Department of Justice. The subsequent ripple effect of fear spread quickly, prompting other file-sharing sites to go dark preemptively. Meanwhile, the free and unfettered exchange of ideas and information amongst millions of legitimate Internet users has been eviscerated. Kwamy, Nico, Rochereau ~ "Les Merveilles du Passé 1965"
The Tale Of Floyd Collins comes to us from Arkansas native Ronnie Hawkins, who found success and fame after following Conway Twitty's advice and relocating to Canada. In 1960, several decades after the fact, Hawkins, a cousin of rockabilly pioneer Dale Hawkins, released this topical song about the 1925 death of cave explorer Floyd Collins who became trapped 55 feet underground in what is now part of Mammoth Cave National Park just outside of Cave City, Kentucky. Collins got stuck while exploring and though rescue teams worked around the clock to try to save him, they were ulimately unsuccessful and after 14 hellish days Collins succumbed to exposure, thirst and starvation. OK, now this is really the last edition of the series, the rest of which you can read here. This time we've got Kurt Gottschalk and Jeffrey Davison up to bat. I am a horrible listener: Fickle, inattentive, in constant need of amusement and novelty. It’s true that I would gladly listen to Prince or David Murray solos every chance I get for another 20 years, but for the most part I’m interested in nothing quite so much as something unusual. Novelty, all too often perhaps, trumps artistic merit. I’m willing to admit it. The thirst for the fresh is hard to keep quenched, of course. It’s an upriver battle. The more you hear, the more things there are for new things you hear to sound like. So when something comes along which is both fresh and artistically stunning, I get excited. I’ve hosted the text and sound artist Alessandro Bosetti on the WFMU waves twice: once with his Mask Mirror project and again with the Japanese audio artist Adachi Tomomi. His 22-minute and wonderfully repetitive piece “Exposé #10” even became something of a minor and controversial hit on Miniature Minotaurs. After seeing his band Trophies – perhaps the pinnacle of his text-with-music works – I’ve been eagerly awaiting a recording debut. When it finally came, it was on Monotype, a Polish label with which I was only passingly familiar despite the fact that they had some three dozen releases in their catalog. Become Objects of Daily Use came out in July of 2011, only a few months after another Bosetti disc, Royals, which also built extended melodies out of the cadence of repeated, spoken phrases. My attention – ordinarily too distracted by balloons and shiny objects – was focused, and I soon found other remarkable releases from the label’s 2011 catalog, including an amazing processed drum drone piece by Lasse Marhaug and Mark Wastell called Kiss of Acid and a fantastic collection of field recording based pieces by Lionel Marchetti called Une saison. It feels good to be this excited about a record label. But the taste, of course, is twofold bittersweet. Monotype will now not just have to continue this level of excellence but raise it to keep hold of the off-kilter carousel of my whimsy. And failing that, the bar is just that much higher for the next contender. Disclosed for man to dread or woman weep. In 1960, while on a scouting journey for locations for Mutiny On The Bounty, Marlon Brando visits the atoll Tetiaroa and falls in love with the former home of Tahitian royalty. Two years later, Brando marries his second Mutiny co-star, Tarita Teriipia, who played his Polynesian wife in the film and purchases Tetiaroa for $200,000 with the intention of making it his home. Little did Brando know what his island paradise would bring he and his visitors, for in acting, one not only brings himself to a role, but the role can transform the actor's real personality, permenantly -- a most dangerous game for friends and family of the 'Godfather' and 'Colonel Kurtz'. Suddenly, I was up in the air, floating gently for an instant before falling towards the earth and crashing with only the foam padding of my chicken and Brie sandwich suit to cushion the violent impact. Viagra Thunder, that rotten bovine, had bucked me off to put a scare into me before we left the chute. Out of the corner of my eye I saw him laughing and then my head cracked against the hard arena floor, and everything went black. When I opened my eyes, I found myself standing in a rodeo arena, but instead of bleachers surrounding the fence, rolling towards the horizon was an infinite prairie of billowing white clouds. “Bet you’re feeling a might confused, eh there buckaroo?” I turned towards the source of that gravy-smooth voice, and there, standing before me was rodeo legend Smokey Snyder dressed in the finest cowboy splendor and glowing faintly. Today, a handful of 45 RPM records from the fringes, a few favorites of mine that might become favorites of yours. I know nothing about the performers heard here, aside from the names on the labels, and in one case, there isn't even a name on the label. 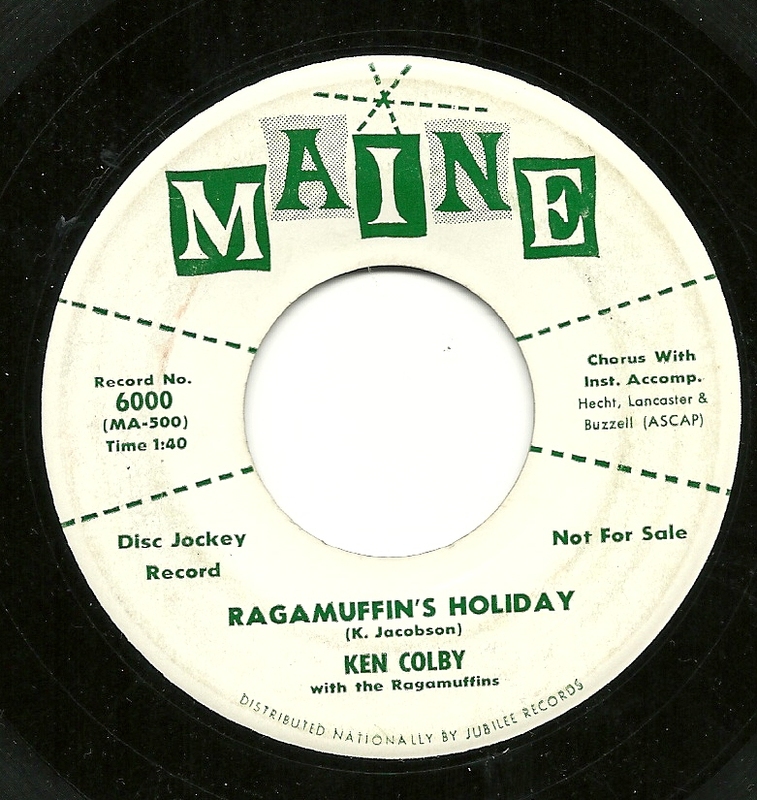 First up, a boisterous offering from someone named Ken Colby. The playful piano, the oompah tuba, the sweet accordion, and the wordless la-la-la's from a chorus of kids, what's not to love about "Ragamuffin's Holiday". 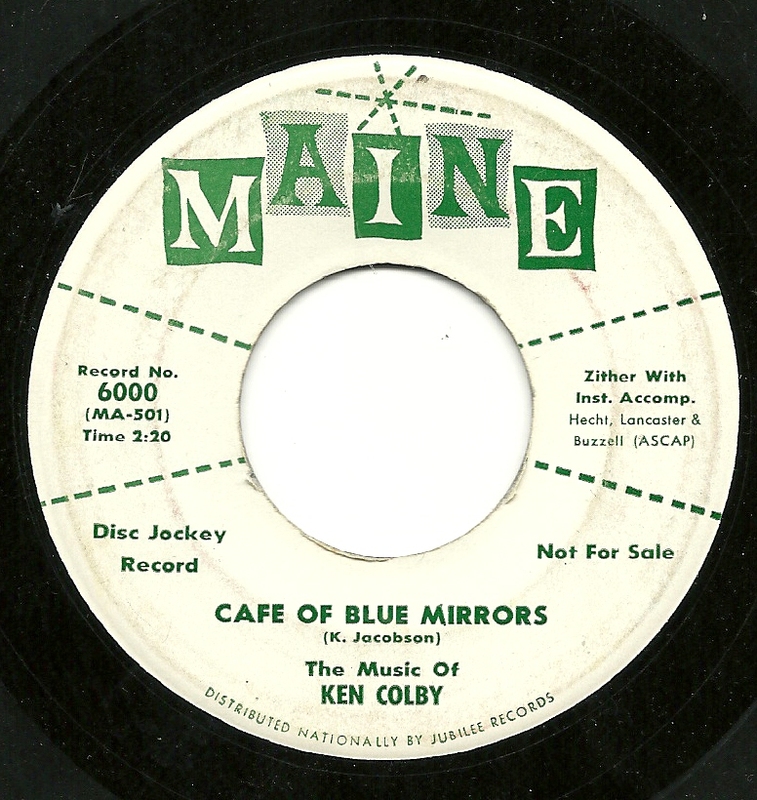 The Ragamuffins of of the title are replaced by Ken's "Music" for the flip side, an arrangement reminiscent of "The Third Man Theme" with a Marlene Dietrich chaser, titled "Cafe of Blue Mirrors". 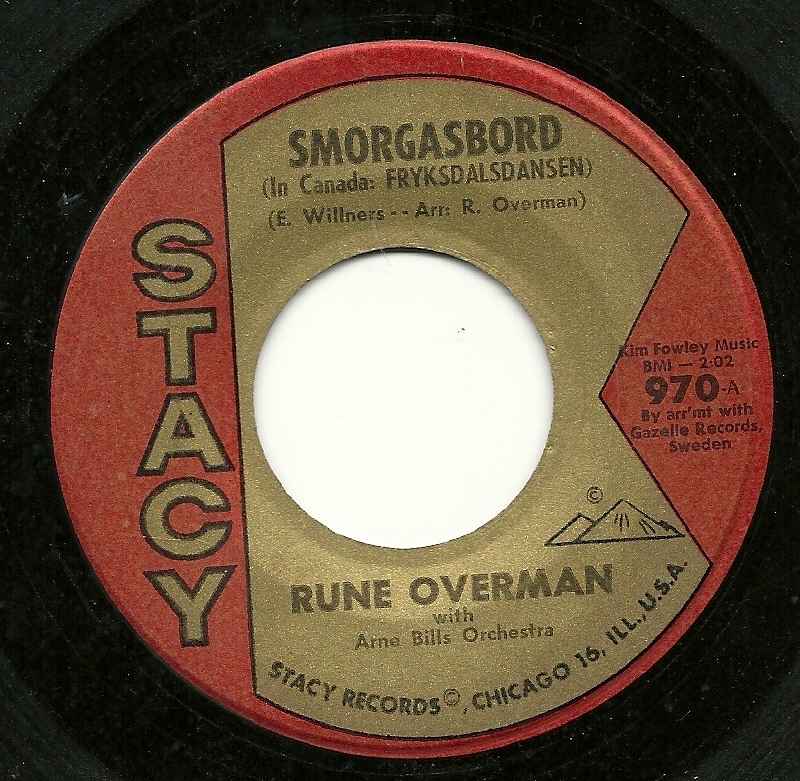 Next up, the fabulously named "Rune Overman", with an instrumental twist number titled "Smorgasbord", which we are helpfully advised should be called "Fryksdalsdansen" in Canada. This is a Swedish record which somehow ended up on a Chicago-based label, and it's an irresistable mover with a feel that reminds me a bit of Grynet Molvig's incomparably wonderful "Johan Pa Snippen Twist" which I featured a few years ago. 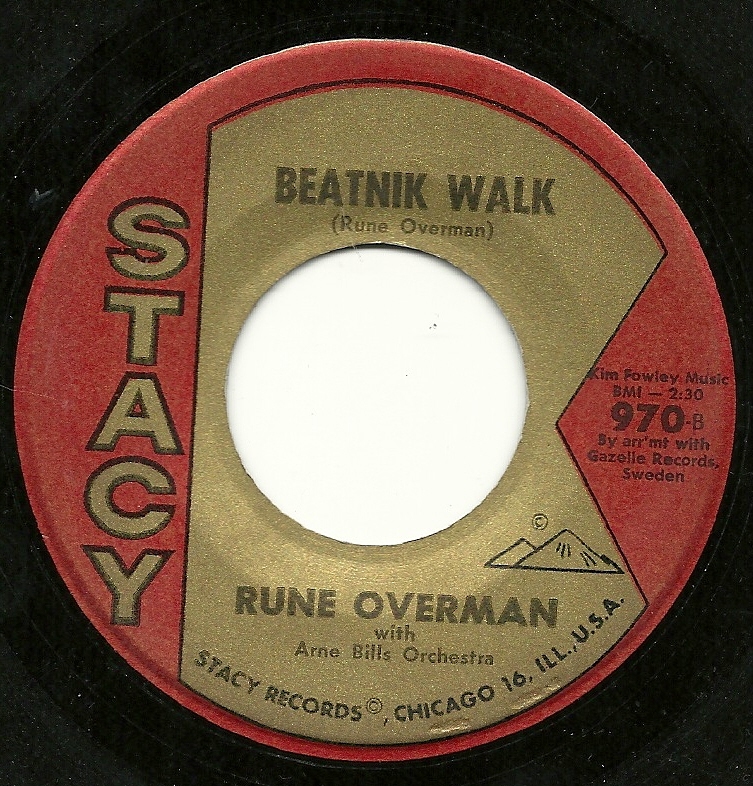 The flip side, no slouch itself, is the slower groove of "Beatnick Walk". Perhaps you had one in your family. It was a decade of rambling, disconnected souls seeking a way out of a button-down life. Scruffy, a bit worn-down at the heels, rather old to be "dropping out". Hippy hoboes. Nature boys and girls. Old beatniks. In the case of the character in question today "J. P. Rags", a bit childlike, a folkie nature boy slinging a guitar, sitting on the railroad tracks to dump gravel out of a worn but stylish boot. You know that there's more to him than that. He has several stories and lives that he has perhaps walked away from. And Mr. Rags has songs about what he has learned, written in an innocent, caressing tone, hard to listen to uncynically today, but seemingly heartfelt and well-meant at the time. Here's a song from his one and only album; and then come back and see what we've been able to find out about the elusive Rags. 35 years after its release, Tapesongs remains one of the most stunning albums in Joan La Barbara's discography. No mean feat, given that every album La Barbara has released stands as a powerful testament to the capabilities of the human voice as not only the "original instrument," as she asserts on another album, but also the best instrument. The most striking of the trio of pieces on Tapesongs is La Barbara's realization of John Cage's "Solo for Voice 45," from his Song Books. La Barbara had worked closely with Cage before and had performed and worked on portions of the piece before recording Tapesongs. For the album, La Barbara decided to record the entirety of the piece. She approached Cage with the idea of recording "Solo for Voice 45" in horizontal layers; he then worked with La Barbara to distribute the 18 pages of the score into 16 separate tracks. Each track was panned into 16 individual "pieces" across the stereo spectrum to maximize "spatial movement," as La Barbara writes in her own description of the piece. "Solo for Voice 45" is a "classic" Cage piece, taking on a new form at each performance dictated by chance operations and the singer's interpretation of the piece. The piece's pitches were derived from star maps, with its organization dictated by chance operations, utilizing the I Ching. There are numeric instructions as to how and how many times the singer should sing each note, and, according to La Barbara, the groups of pitches, "Are to be sung as fast as possible in calligraphic strokes approximating the star configurations they represent." La Barbara used chance operations herself in order to determine which phrases were to be sung with the French pronunciation of the alphabet, and which were to be sung in the English pronunciation. DJ Handi's Archive Picks: Turbotax Meets Freeform. Frank O'Toole started the week on More Exciting Moments, playing new material from Christine McBride next to Thriller Houseghost's remix of Radiohead. TKOL also remixed the band: "Little By Little" was selected by Jesse on the Fro Show. "3E" by the No Wave band Mars was played on Marty McSorley's show, from a reissue of their 1978 album, Live Artists In Space. This week, Tuesday, the 24th, 6-9 AM, Marty will have live music on his show from The Immaculates Miniature Minotaurs with Kurt Gottschalk, today from 3pm-6pm, will also have a live guest, composer Eve Beglarian. Last week, Kurt included music from Matthew Shipp in his Friday The 13th Monkathon. On Tuesday the 24th from 12pm-2pm, Scones radio will Podcast DJ Space Jam, who will be playing 90's house music. Space Jam is the resident DJ at New York dance club, TURBOTAX. The last Scones Radio show kicked off with the track "Lover" by Blondes. Also on the 24th, On Three Chord Monte, Joe will have Brooklyn garage punk band The Siberians from Noon-3pm. Bill Dees, who wrote "Pretty Women" and "It's Over," for Roy Orbison will be on Night People, 7-8pm on Thursday, January 26th. Here's a strange television piece on Swedish psychopaths Brainbombs in the 90's, centered around what may possibly be one of the best band interviews ever. Tongue-in-cheek discomfort reigns in abundance, which may help take a bit of the edge off the band's absurdly anti-social m.o. Be sure to click the Closed Caption button on the video, unless you're fluent in Swedish. It has been 13 long years since (((unartig))) was last involved in promoting a show. But the hiatus is history. Or to quote ATDI: This station is now operational. Below are video edits of our co-production with BBG/BrooklynVegan at Saint Vitus on January 14. More from this show below. Here we are at Motherlode #150 and it doesn't feel a day over 100. Strange to think that when we started this weekly column, your ol' miner still lived in Brooklyn, and he still had a damn job. Surely by now he's adjusted to life in the Steel City, but if he could just get someone to pay him to scour 600+ music blogs for the best free music online, he'd be well on his way toward delivering another 150 weeks of sonic spelunkery. No worries, friends. As long as there are sites where music is presented thoughtfully and with reverence—like the exceptional African music blog Worldservice (see our lead item, below)—producing this survey will continue to be as richly rewarding as it was back in January 2009. Alhaja Hassanah Waziri ~ "Oghena Iruduna"